The Book of Ezekiel is divided into two great parts, of which the destruction of Jerusalem is the turning-point. Chapters 1 - 24 contain predictions delivered before the event, and chapters 25 - 48 after it. Chapters 1 - 32 are mainly occupied with correction, denunciation, and reproof, while the remainder of the Book of Ezekiel deals chiefly in consolation and promise. A parenthetical section in the middle of the book contains a group of prophecies against seven foreign nations, the septenary arrangement being apparently intentional. 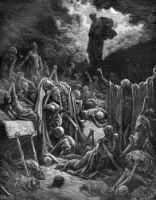 There are no direct quotations from Ezekiel in the New Testament, but in the Apocalypse there are many parallels and obvious allusions to the later chapters. These illustrations from the Book of Ezekiel are from several biblical texts. Feel free to use these Book of Ezekiel pictures in your artistic creations. Click on the drawings below to see more details about saving a free image or about purchasing an image from the Book of Ezekiel at a higher resolution.